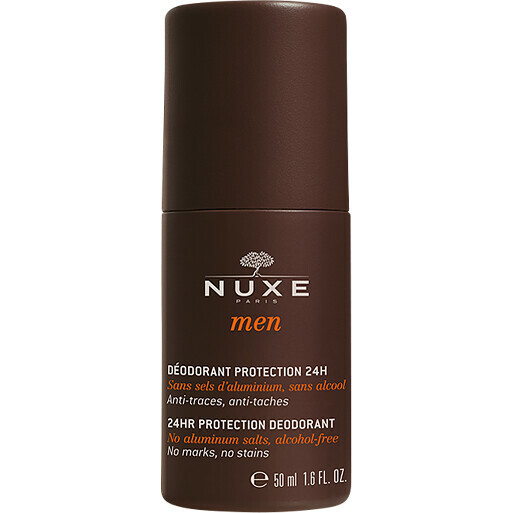 Stay fresh and dry all day with the Nuxe Men 24hr Protection Deodorant. This effective formula guarantees protection throughout the day and night.. The deodorant is created without aluminium salts or alcohol to ensure gentleness and perfect balance. It doesn’t leave any stains or marks, and is ideal for even the most sensitive of skins. The Nuxe Men 24hr Protection Deodorant is made with sage floral water to reduce excessive perspiration, corn powder to absorb humidity, and a blend of sandalwood and phellodendron to limit irritation. All day long, unpleasant odours are minimised, and the skin feels comfortable and soothed. Nuxe Men 24hr Protection Deodorant 50ml is rated 2.5 out of 5 by 2. Rated 4 out of 5 by Jez99 from An Effective Natural Deodorant I have found it difficult to find an aluminium free product that is effective, and lasts for the day. This deodorant works well, has a pleasant masculine scent and lasts through the day. I find I have to use aluminium free to prevent skin irritation, and this is certainly kinder on the skin. The only downside in my opinion is that the bottle is fairly small, and does not go too far, but otherwise excellent product. Rated 1 out of 5 by SunshineCharlie from Not a good deo This is the worst deo I have used. It has a strange smell and a gloopy consistency which makes it difficult to apply. Used 3 times and I am not using again.The product will be binned and I will put it down to a bad experience. Nuxe for Men is a product range that I will never use again.